We were last in Zion National Park in 2007. It was June, and it was 106 degrees when we arrived. After a 90-degree night in a tent in high winds, we decided that maybe this wasn't the best time to be in Zion, so we spent a day seeing the highlights and got ourselves out to cooler places. Flash forward 11 years, and we are back in Zion, this time in March. The weather is much, much nicer, and we're able to do all the hiking and sightseeing that we want without extreme heat worries. Well, mostly. It seems that in the intervening year,s Zion has become a more popular place to visit, with annual visitation around 4 times what it was back in 2007. And we're here during spring break, when everyone from Los Angeles and Salt Lake City is here too! We did not expect this. Zion has a shuttle bus system to take people into the canyon. You can't drive your car in most of the park, and with good reason. With half a million people visiting in a typical month, the road would be jammed with bumper-to-bumper traffic with no one finding a parking place. The shuttle buses take visitors to eight different stops in the canyon with a hop-on/hop-off type system. It's free. And it works pretty well, except during spring break. On Saturday, we rode the shuttle bus to a few locations to do some hiking. We had to wait about 30 minutes to board the bus down at the visitor center. The line was long, but it moved quickly as new shuttles arrived every few minutes. But the following Tuesday, even though we got to the park early, the line was somewhere around 2 hours long! We didn't stand in line that long; we just hiked up to the next shuttle stop and got on there, saving about 1 1/2 hours. But it does show just how popular this park has become. But there's a quiet side of Zion. There's an entrance off I-15 that is about an hour's drive from the main area. This is called the Kolob Canyons, and it probably gets visited by fewer than 1% of the Zion visitors. But it's just about as spectacular as the more famous Zion sites. Kolob Canyons consists of a series of narrow slot-canyons that extend back into the mesa. Here we are looking down one of them. 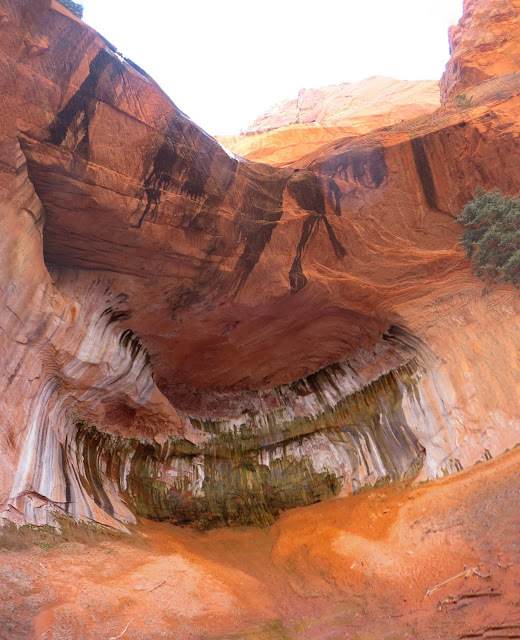 We found a nice day-hike that follows a stream in one of these slot canyons. It's called the Taylor Creek Trail, and we highly recommend it. The rangers at the visitor center had recommended it, but we had no idea just how spectacular it would turn out to be. At five miles total (out and back) it's not particularly long. And since it follows a stream, there's not a whole lot of elevation change, so it's an easy walk. Except that you have to cross the stream a few times. Fifty-four times. Each way. Fortunately, the water level in the stream is generally low, even in spring, so this is not really a major concern. And the view along the trail as you get farther into the canyon is worth it. The walls of the canyon tower above you on both sides. The sunlight against the wall makes the whole place glow orange (which is difficult to capture in a picture). The trail ends at a double-arch alcove. Note the icicles hanging over the edge. Arrive early -- like 9:00 or earlier. After that you may not get a parking spot. If the Visitor Center parking lot is full, go to the Nature Center and park there. It's the last parking lot to fill up. If the shuttle-bus line is too long, hike up the Pa'rus trail to the Human History Museum and get on a shuttle there. If you have just one day, visit the famous sites in the main canyon. If you have more than one day, be sure to drive out to Kolob Canyons and hike the Taylor Creek Trail. If you want an exhilarating hike, consider Angel's Landing. If you think you'll have trouble with the section that has sheer drop-offs and chains to hold onto, just stop at Scout's Lookout. It's 3/4 of the way to the end of Angel's Landing, and the views are quite spectacular. Don't go when it's going to be 100 degrees or more. It's just not enjoyable. If you stay in the town of Springdale, try to be walking distance to the park so you don't have to deal with long lines at the entrance station and battle for a parking spot.